of dust from the asteroid 25143 Itokawa when it parachuted into the Australian outback in June 2010. Already, the samples from this 1,800 foot-long (550 meter) rubble pile have helped solve the longstanding mystery of where most meteorites striking our planet come from. 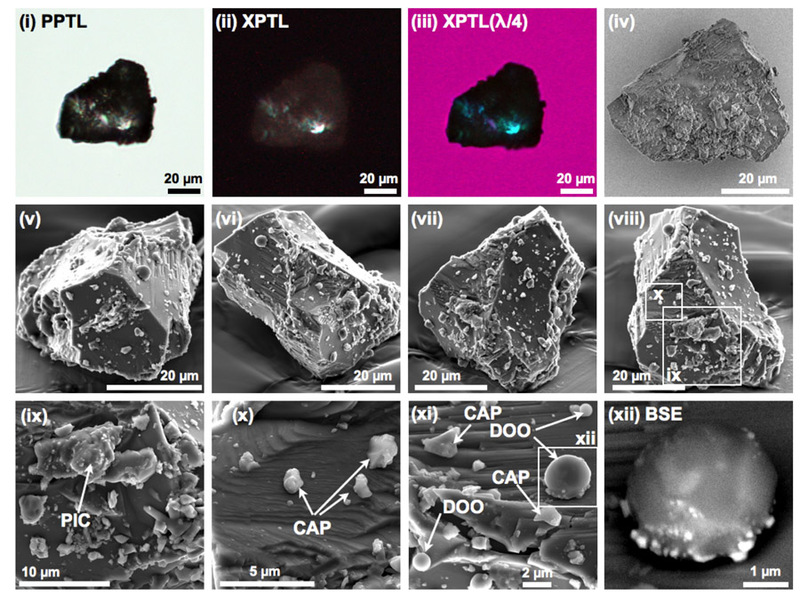 To uncover still more details about asteroids, scientists analyzed the size, mineralogy, shape and geochemistry of five dust grains recovered by Hayabusa. The smallest of these was just 40 microns, or millionths of a meter, in diameter, less than half the width of a human hair, and were cut into pieces using focused beams of electrically charged ions for analysis under microscopes. The surfaces of these five grains were dominated by fractures, suggesting they might have experienced shocks from impacts. The walls of these fissures contained not only craters just 100 to 200 nano meters (billionths of a meter) wide, but also a large number of particles stuck onto them, ones several microns wide or smaller. The size range and chemical composition of the particles stuck on the sides of these fractures, along with the presence of nanometer-sized craters, suggest the pitted surfaces of these grains were formed by micro-meteoroids just nano meters wide colliding into the asteroid. These impacts were high-energy, hitting at speeds of about 11,200 to 22,400 mph (18,000 to 36,000 kph). Asteroids are often considered primitive objects left relatively unchanged since the formation of the solar system. These new findings reveal their surfaces have actually experienced much “space weathering” over time. The fact that Itokawa and similar asteroids are airless bodies with minimal gravitational fields means that dust may regularly get kicked off them by impacts. According to scientists this microscopic debris likely then goes on to constantly slam into other interplanetary objects in outer space, playing a major role in their shaping and evolution.